As of today, it is reported that in Ocean County, where I reside, 107 young people have died of drug overdoses this year. That is a staggering figure.I know that a complex mix of factors have brought about this tragic loss of life, but I do sometimes wonder if the stressful circumstances experienced by many families here over the past year have not somehow played a part in this sorrowful trend in an effort to escape some harsh realities. That would be a matter for a mental health expert, I suppose. I watched news coverage of drug-sniffing dogs deployed in the halls of a local Ocean County school the other night. The hope was that this would serve as a detriment for drug use, at least on school grounds. These highly trained dogs have an amazingly accurate success rate at drug detection. Watching, I also recalled how dogs were used here after Hurricane Sandy, for the purpose of Search and Rescue, once again serving us in dark times. 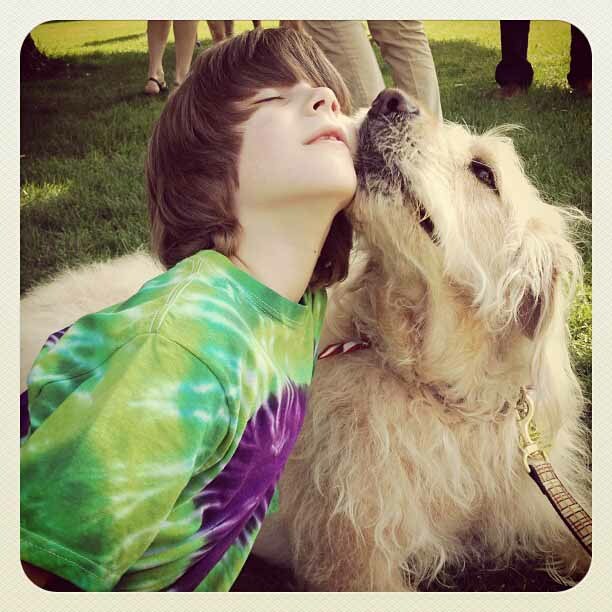 As the nation recalls the terrible tragedy of Newtown, Connecticut, we find a dog connection, too. Dogs like Bocker-the-Labradoodle, have become an important part of healing and recovery for the residents of this traumatized community. This got me to thinking. Why do we often only “bring in the dogs” after things have gone so wrong. In the cases of Ocean County and Newtown, am I naïve to think that perhaps if the care of dogs, and other pets, were part of an educational and therapeutic curriculum, perhaps there might be a decrease in mental illness, isolation, and subsequent drug use? I know there is no sure way to solve all these problems, but I think that many places, including schools, might “turn to the dogs” as they search for ways to detect and treat many who need help, but slip through the cracks, and in doing so, keeps us in the dark ages. 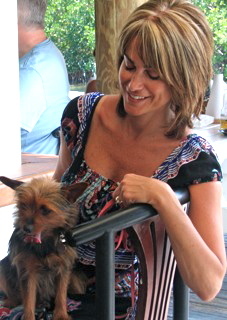 The following is post written by Marie Shelto, a great supporter and friend of National Dog Week. She and her lovely dog, Bocker, have always been there to lend a paw, in good times and bad. We need more of them in this world. Thank you, Marie, and Bocker. There has always been something very special about Bocker. Even as a very young pup, Bocker the Labradoodle pondered on where his life would lead, what was his purpose in life. Whether it was his human eyes, head tilt or calm demeanor, he was packaged with love and with the ability to make people smile. A friend wrote about him saying, “Bocker never gets his curls in a knot.” Children always comment on how big he is, but I think because he is tall, he can look the children in the eye and a certain bond is created. Bocker is very huggable and he is a great kisser. All of these attributes make him the perfect candidate for therapy work. It just seems like it is his nature and it came built in. Young or old, whomever Bocker visits, he is able to make a lasting impression and surely brings lots of smiles. Bocker can sense if the person he is visiting wants big loving kisses or would rather he just stand next to them and provide support. He has worked as a “Tail Waggin Tutor” helping children improve their reading skills and actually help them think of reading as fun. He is invited to schools where he visits classrooms and is most happy to pose for photos and give his famous “Bocker head tilt” when smiling for the camera. Through tragedy great friendships are born and so was the case when Bocker was asked to visit Newtown, CT after the shooting at Sandy Hook Elementary. He was invited to the C. H. Booth Library in Newtown to have children sit with him and read their stories as well as his book, “Chasing Bocker’s Tale”. What a wonderful day. Bocker’s book is his own tale of his amazing journey and how he has touched the lives of so many throughout the world. It has now been made into a DVD for younger children and had its debut in Newtown. After Bocker’s initial visit to Newtown, he has been invited to almost every event that goes on in the town and has developed many lasting friendships. He makes everyone smile and spreads lots of love. Now when he walks down the street, he is sure to hear someone say “That’s Bocker.” Even The Toy Tree store in Sandy Hook has a poster of Bocker, as well as selling his plush toy, book and DVD. A very lucky doodle for sure. Bocker no doubt makes a difference and that makes me very proud. Bocker is always ready to lend a helping paw. He is very much an advocate and activist for animal rights, being the SpokesDog for NYS Animal Advocacy Day. 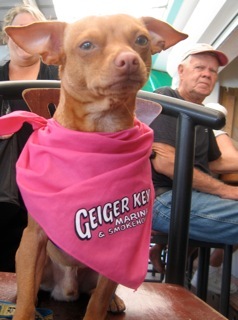 He is also always on hand at fundraising events for shelters and rescue organizations. Yes, he has done movies, appeared on tv and in fashion ads and has friends all over the world, but his most important work is with children and in helping those less fortunate than he. I am very lucky to follow in his “paw” steps. He is definitely leading me down the right path.